The final plane of existence for many over the road tractors occurs when it is converted to a dump truck. Usually by this point the truck has an odometer reading that we wished resembled our bank account balance. Often selling for a low dollar amount an enterprising individual picks up the truck and finds an equally thrifty dump body. Boom. Dump truck. This old Marmom probably looked better with a fifth wheel and was most likely better suited for a life over the road that conditions typically found in dump truck work. Who knows, maybe with all this e-log nonsense someone will convert it back to a tractor! This entry was posted in Lost and Found and tagged marmom dump truck. Bookmark the permalink. 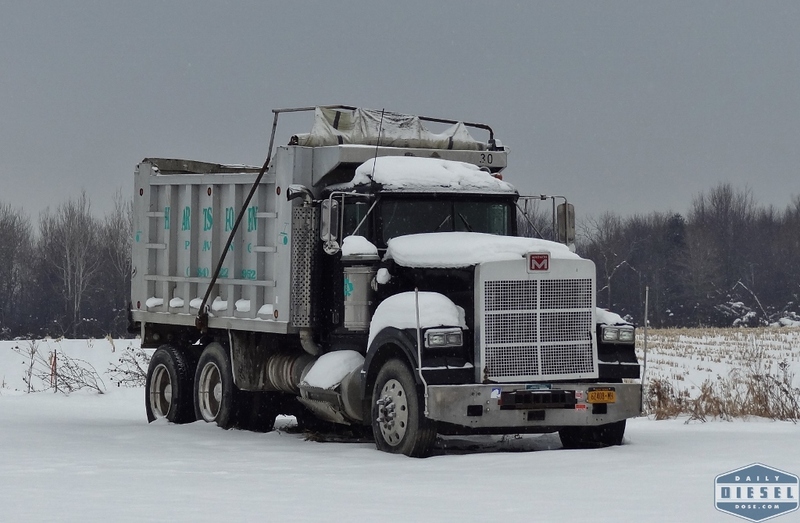 That truck was owned by Hartsthorn paving out of Putnam county, NY. I remember seeing that truck for years. Where is it now? I found it just outside of Watertown, NY, directly to the Tracey Road dealership off of I-81.